Crust: Preheat the oven to 350F. Combine flour and butter in a food processor. Pulse 7 to 8 times, until mixture resembles coarse meal. Add the cold water, one tablespoon at a time, pulsing after each addition. If dough seems too dry, add additional cold water by the tablespoon. Remove pie dough from food processor and mold into a circular disk. Cover and let refrigerate for at least 25 minutes. Roll out dough on a floured surface and transfer to 9-inch pie pan. Trim any crust overhang, fold under and crimp the edges. Prick the bottom and sides with a fork. Place a large piece of aluminum foil on top of dough and fill with dry beans or use pie weights. Par-bake in the preheated oven for 15 minutes. Remove the aluminum foil and beans or pie weights. Add the lemon filling (prepared in next step). Lemon Filling: While the crust is par-baking, prepare the filling. In a large saucepan over medium-low heat, whisk the butter, sugar and lemon zest until the butter is fully melted. Add the flour and continuing whisking until incorporated. Remove from heat and whisk in the lemon juice, Kefir, vanilla extract and eggs. Continue whisking the mixture until all ingredients are incorporated. Pour the lemon filling into the bottom of the par-baked pie shell and return to the oven. Bake for 40-45 minutes or until filling has set. Remove from oven and refrigerate 30 minutes. 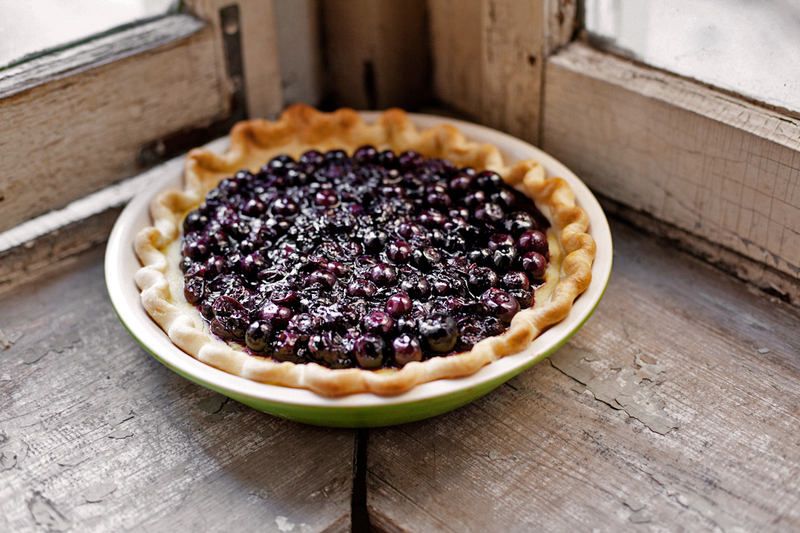 Blueberry Compote: Combine 3 cups blueberries, water, sugar and honey in a medium sauce pan. Stir coat the blueberries, then cook over medium-high heat for 10 -12 minutes, stirring occasionally. Remove from heat, and stir in the remaining 1 cup of blueberries. Pour on top of lemon filling and return to refrigerator for 3 hours before serving.